I saw your FB posts on DBS. Thanks for sharing again. I did buy some DBS shares after attending one of your talks last year. I made a bit of money. Been waiting for the price to drop. 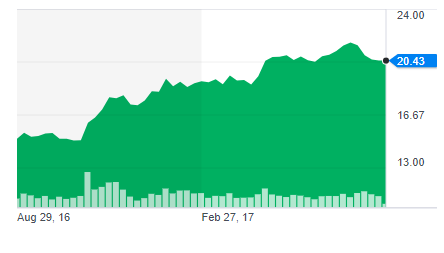 My broker told me it will go up higher. Should I buy back? I wonder what did your broker tell you about DBS last year? Just curious. Since you attended "Evening with AK and friends" last year, you might remember that I explained buying into DBS then was buying in at a nice discount to NAV and also at a single digit PE ratio. Many were worried about the bank's exposure to the troubled O&G sector and I explained that only about 6% of the bank's loan book was exposed to that sector. Even if they had to write off everything, however unlikely, we would still be buying at below its NAV back then. There was a margin of safety, I felt. I also pointed out that the bank's CEO, Piyush Gupta, was buying more DBS shares at $13+ a share. His purchase amounted to more than $2 million. That kind of insider buying has to be a vote of confidence. I couldn't ignore that. He is not buying more now and I believe he has, instead, cashed in not too long ago. Why did he sell? I don't know. You have to ask him. Looking at the numbers now, DBS is trading way above its NAV and at a double digit PE ratio. Mind you, it does not mean that its share price cannot go higher from here. However, DBS is just no longer the bargain that it was last year. 1. Wait for big crash to pick durians. 2. 2016 FY passive income (non-REITs). "Using a strategy I employ frequently for stocks which I am highly confident in, my relatively large position in DBS included both a core position for income as well as a trading position." FY 2017 passive income from non-REITS. Honestly, I was surprised that all 160 tickets were snapped up in less than 4 hours. It has never happened before. In the past, tickets took a day or two to sell out. I have no plan for another session this year but, very likely, there will be another one next year. Might have to make it bigger too. I thought I might have another public appearance this year apart from InvestX Congress when a local brokerage invited me to talk to their clients. However, when I asked about my fee, they went quiet. I am keeping an eye on DBS. projections. Given the 23% yoy and 28% qoq decline in 3Q’17 bottom- line, partly off set by the brighter outlook painted by management, we are lowering our rating to “Neutral” from “Buy” and removing the stock from our recommended stock pick list.